Good evening everyone! After giving it some thought, I've decided to shift some of my hobby time toward Twitch. I'll still be posting on my blog every Monday and I'll definitely be keeping up with works-in-progress photos on Twitter. Regarding Twitch, I'll be creating a schedule where I'll be painting live in the evenings at least twice per week. While it's challenging to hold still enough to paint under a webcam, talk about what I'm painting, and interacting with chat all at the same time, I'm enjoying the experience. Sometimes when I need to make quick progress on a miniature, I'll paint offline. 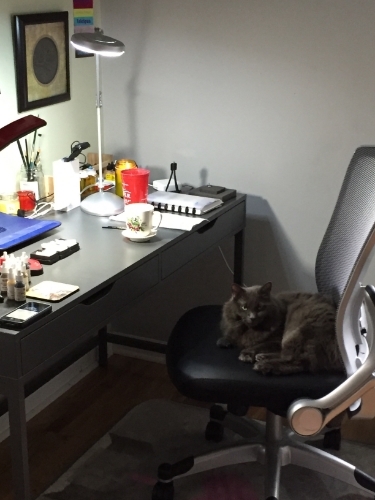 Otherwise, I value sharing this hobby with others and it's nice to have some company while I paint. 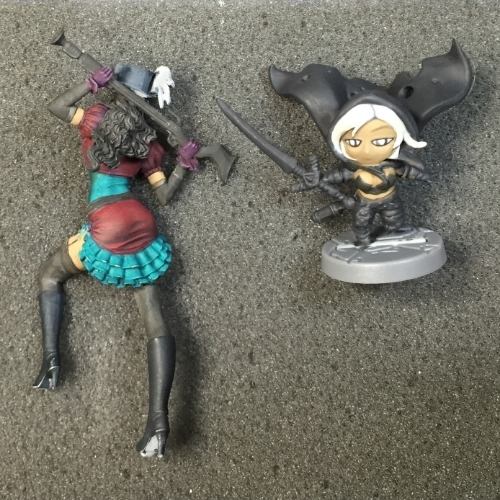 We had a nice time this past Saturday and I painted for about 3 hours and made some significant progress on the back of the Scale 75 "Carla McCarthy" and a brand new Super Dungeon Explore "Twilight Knight" chibi. Speaking of Super Dungeon Explore, MiniatureMarket had some chibis on clearance and I bought these 6 for less than $40 (not including shipping). Still, that's not bad since they're usually approximately $12 each! Also, there's less than 48 hours to go on the most recent SDE Kickstarter. I've chosen the "Explorer" pledge-- how about you? There's going to be a stupid-crazy amount of miniatures in that December 2016 shipment. In the meantime, I'll start off my chibi collection with these cuties! 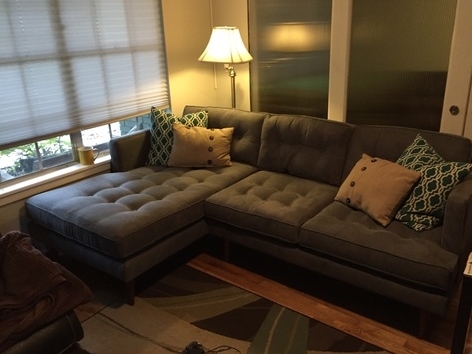 Despite my occasional splurges on Kickstarters and miniatures, The Other Half and I have been saving up for a new couch for over a year-- it's finally here! It's hard to tell in the picture, but it's a slate blue/grey couch with a nice herringbone pattern. I love it. Seriously, it's the nicest thing we own now and I refuse to eat or drink while sitting on it. It's perfect for lounging and playing D&D which is exactly what we did on Sunday morning. We played a brand new 5e campaign with friends in different states and countries on Roll20.net-- it was a ton of fun! On Saturday night, I cleaned my desk before streaming on Twitch. Unfortunately, my cleaning displaced the cat from his current favorite lounging spot-- he was not amused. If that much painting and D&D gaming wasn't enough, we also had a "Board Game Night" late Sunday night with some new friends we met at another friend's birthday party a few weeks ago. We were the "trial members" to their established gaming group when they needed 2 extra people to play the Arkham Horror game. I'm happy they had us in mind! Of course, being the newbie that I am, I brought about $60 worth of snacks and food since we were going to a strangers house to play. I know how much time & effort it takes to get your house ready for company, and I couldn't show up empty handed! (My mother would probably find out and choke me if I showed up empty handed as a guest. She's a stickler for good manners). I'm happy to report that we had an absolute blast! Arkham Horror is one of the more complicated board games I've played so far. There are a lot of pieces to the game-- both literally and mechanically-- and while the rulebook looks fairly thin, the print is insanely small and we spent 70% of the time playing and 30% of the time consulting the rule book. 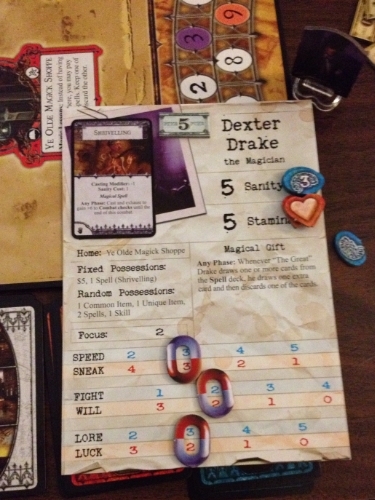 I chose the investigator "Dexter Drake" during our 4 hours of play and I'm glad I did since he's a fairly balanced character. While I won't go into the details, the game has a lot of replayability with the myriad of baddies and chances are, you'll want to play it a few times to become comfortable with it since we had a few "Wait. Guys, we've been doing ___ wrong" and we had to revisit the manual rule book often. Luckily, we kept it casual and fun since we were all fairly new to the game and learning as we went along. If you want to read more about the game, check it out here! Other than that, I'll be sure to update you when I finalize my Twitch stream schedule. I'd love for you to join me while I paint-- it's something that I love to do whenever there's time for it and I'm happy to share with anyone else who's interested! Feel free to follow me and choose whether or not to get notifications when I go live. Just click on the image below and it'll lead you to my Twitch profile. Until then, see you next "Mocha Monday"!